If you’ve ever shared your life with a pet, you know: love changes everything. It changes your mornings. It changes your routines. It changes your perspective. When you share your life with a pet, it doesn’t just change your life. 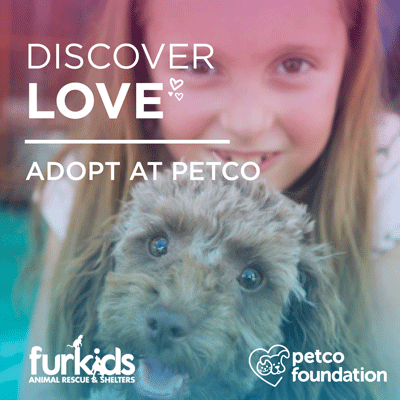 It can change the world for animals, which is why Furkids and the Petco Foundation are inviting you to Discover Love at Petco! Furkids will have adoptable cats and dogs at these Petco stores for the Petco Foundation’s National Adoption Weekend on February 16 & 17. The Petco Foundation, in partnership with Furkids and thousands of local animal welfare organizations nationwide, has helped unite more than five million pets with loving families through adoptions in Petco stores.